When you ask what type of cheese your friend wants on their burger, they don’t respond: “Oh, just pasteurized prepared cheese product, thanks!” But that’s the technical fine print that graces the front of Kraft Singles packages, similar to the “pasteurized recipe cheese product” listed on the Velveeta box. Are these products actually cheese? Or are they something more nefarious masquerading as cheese? You can exhale: They’re pretty much cheese. The U.S. Food And Drug Administration is responsible for defining cheese and cheese products, a full listing of which is available in the Code Of Federal Regulations, part 133, subpart B. (Fascinating reading, that stuff.) There, the government has set the standards for cheeses, cheese products or—even more creepy-sounding—cheese foods. But what mainly separates those latter two from just plain cheese is actually what binds them together: emulsifiers. Emulsifiers are molecules with one hydrophobic side and one hydrophilic side, which is what enables them to bind oils and water (explaining why olive oil and vinegar separates). With easy names like sodium metaphosphate, potassium citrate, and dipotassium phosphate, they’re responsible for binding disparate parts of a cheese product together to create a stable, smooth consistency. You’ll also find them in ice cream and processed meats such as hot dogs and bologna. Straight-up cheeses like a brick of aged cheddar don’t contain emulsifiers to bind the fats and water together, so when you heat them, those cheese begin to separate into oils, water, and solids—not very appetizing. If you’ve heated a cheese and seen little beads drip out of it, you know the struggle. But around 1912, a cheese pioneer named James L. Kraft realized that adding sodium phosphate to melting cheese kept it uniform. The idea was so revolutionary and appealing that he built it into an entire gooey-cheese empire. 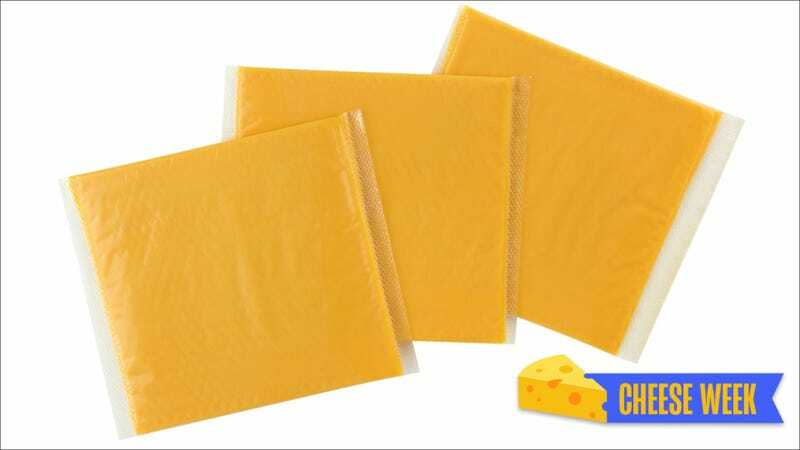 That type of meltable cheese—Kraft Deli Deluxe, Kroger, and Land O’ Lakes brand slices, for example—are labeled pasteurized process cheese. The FDA defines those products as made by “mixing, with the aid of heat, one or more cheeses of the same or two or more varieties,” adding an emulsifier, and then conforming it to myriad rules about moisture and fat content. The emulsifier may not make up more than 3 percent of the weight of the total pasteurized process cheese. Manufacturers can use more additives (such as an anti-sticking agent) in pasteurized process cheese food, so long as actual cheese ingredients make up not less than 51 percent of the cheese food’s total percentage by weight. Pasteurized process cheese spread is similar in terms of composition, but it must remain spreadable at room temperature, defined as 70 degrees Fahrenheit. “Natural cheese is like the name: made from natural ingredients, including milk, salt, enzymes or cultures and sometimes natural coloring (for example, in cheddar), while processed cheese starts with cheese and then adds emulsifiers, preservatives, salt, etc.,” Jennifer Giambroni, director of communications for the California Milk Advisory Board tells me. If you’re wondering whether a package of cheese contains additives, stabilizers, and emulsifiers, you’ll just have to pick it up and read the fine print on its label. Per FDA rules, the manufacturer can’t try to make the words “process” or “food” smaller than the word “cheese” on its label: “All the words forming the name specified by a definition and standard of identity should be given equal prominence.” That’s why you’ll notice that Kraft Singles, Velveeta, and the like don’t actually say cheese in giant letters. Whether you should buy a wedge of brie, hunk of parmesan, or a slice of yellow American cheese depends on what you’re planning to use that cheese for, of course. If you want to experience a cheese’s particular milk- and enzyme-derived flavor, maybe don’t reach for the plastic-wrapped slices. But if you want a gooey, meltable blanket for your cheeseburger, you’ll likely be thankful for a processed version with emulsifiers.